Heidi is using Smore newsletters to spread the word online. CONGRATULATIONS ON GROWING & SHARING THE MESSAGE OF HEALTH! There are 15 total possible ranks Wellness Advocates can reach. 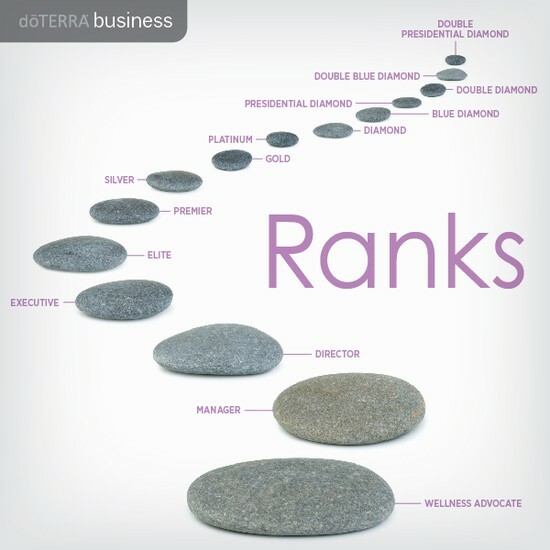 From Wellness Advocate to Double Presidential Diamond, each rank has certain requirements that must be met from month to month to maintain that rank. Once you achieve a rank you maintain the title even if you fall below. However, you are only paid out on the rank that you achieve monthly. We have broken down these requirements for you below. 1. Wellness Advocate: The first step in creating a dōTERRA business is just in setting up. The Wellness Advocate rank must purchase at least 50 PV to earn Unilevel Commission. This does not need to be PV from the Loyalty Rewards Program. It can be any listed under “Monthly PV” above. 2. Manager: A Wellness Advocate becomes a Manager when they purchase at least 100 PV, and have an OV (collective team volume) of 500 PV. 3. Director: A Manager becomes a Director when they purchase at least 100 PV, and have an OV of 1000 PV. 4. Executive: A Director becomes an Executive when they purchase at least 100 PV, and have an OV of 2000 PV. 5. Elite: An Executive becomes an Elite when they purchase at least 100 PV, and an OV of3,000 PV. 6. Premier: An Elite becomes a Premier when they purchase at least 100 PV, and have an OV (team volume) of 5000 PV. They also have 2 Executives who are personally enrolled and in separate legs. 8. Gold: A Silver becomes a Gold when they purchase at least 100 PV. They also have 3 Premiers who are personally enrolled and in separate legs. 9. Platinum: A Gold becomes Platinum when they purchase at least 100 PV. They also have 3 Silvers who are personally enrolled and in separate legs. 10. Diamond: A Platinum becomes a Diamond when they purchase at least 100 PV, They also have 4 Silvers who are personally enrolled and in separate legs. 11. Blue Diamond: A Diamond becomes a Blue Diamond when they purchase at least 100 PV. They also have 5 Golds who are personally enrolled and in separate legs. 12. Presidential Diamond: A Blue Diamond becomes a Presidential when they purchase at least 100 PV. They also have 6 Platinums who are personally enrolled and in separate legs. 13. Double Diamond: (Recently created.) Once a Wellness Advocate has reached Presidential Diamond, they have the opportunity to start a second account. They advance to Double Diamond when the second account reaches Diamond. 14. Double Blue Diamond: (Recently created.) Double Blue is achieved when the second account reaches Blue Diamond. 15. Double Presidential Diamond: (Recently created.) Double Presidential is reached when the second account reaches Presidential.